I absolutely without a doubt loved this book. The Forever Girl is probably in my top 5 books that I've read this year. I couldn't put it down and stay up until 5AM to finish it. Sophia is a 22 year old wiccan, which make her the black sheep of her small Colorado town. She also has a constant buzzing of voices in her head that she wants to quiet. When she goes to a club with her friend Ivory and meet Charles, she learns the world is not as safe or simple as she believes it is and not everyone is who the seem to be. The romance between Sophia and Charles wasn't forced and was more mature than most young adult romances. The back and forth with them had me going nuts and not in a bad way, it kept me wanting to read more to see if they would finally give in. There were a lot of twist and turns throughout the story and just when I thought I was starting to figure it out BAM plot twist it kept me entertained from beginning to end. The story had a great flow to it, nothing was rushed and it progressed naturally. Rebecca Hamilton took the myths of vampires, shifters, and witches to a whole new level that I personally have not seen in anything I've read and I loved it. She also has an amazing writing style that made is very easy to completely lost in the book. 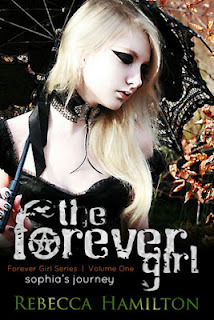 There was nothing I didn't like about The Forever Girl and I highly recommend it to any fan of the paranormal genre. I can't wait to find out what happens in the next book.